As Nobel Laureate economist Paul Krugman has observed productivity over the long term is more important than anything else in determining a nation’s wellbeing. Productivity growth refers to the number of outputs produced relative to inputs used. Increases in productivity enable producers to share the increased returns to shareholders and employees. Productivity is therefore a crucial determinant of real per capita income growth and economic growth, which in turn are important drivers of living standards, wellbeing and of course people’s long term ability to pay higher prices for real estate. There are two primary inputs companies use to generate outputs – labour and capital. Productivity is often viewed relative to units of labour (hours worked), relative to capital invested (on technology, machines etc) or both (multifactor productivity). Multifactor (MF) productivity is the more comprehensive measure as the other two only consider the relationship between the output and a single input. From 1973 to 2004 Australia’s MF productivity growth has been a major driver to Australia’s total output and economic wellbeing. Since 2004 however MF productivity growth has been negative or negligible, a concerning trend. As the Productivity Commission recently stated “the average rate of growth in LP [labour productivity] since 2003-04 has also been well below the longer term average, reflecting the absence of any contribution from MFP growth over this period, and thus almost sole reliance on capital deepening”. Capital deepening is the increase in the ratio of capital inputs used to labour inputs i.e. firms are increasingly using more capital (technology, automation etc) than labour to produce goods and services and as capital is generally more efficient this shift increases MF productivity. The Productivity Commission states that this negative “variation in the rate of growth of LP [labour productivity] over the longer term primarily reflects [the negative] variation in the rate of MFP growth, as the rate of increase in capital deepening has been relatively constant over time”. 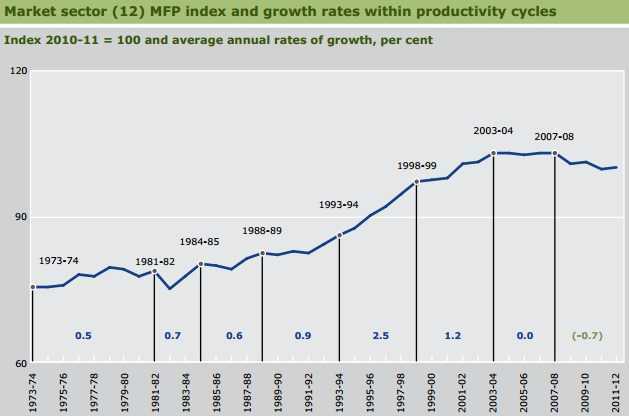 This stagnant increase in MF productivity over the last decade, the below average increases in labour productivity and reliance on capital deepening goes some way to explaining why wage growth has been so slow. What has been driving this reduction in productivity? 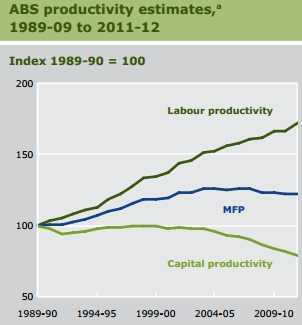 While labour productivity has been slower than long term averages, capital productivity has slowed dramatically (as shown below). The Productivity Commission in May 2013 released a report examining why this has occurred. While productivity is a simple measure the reasons for change are complex. In summary it highlights a broad cross-industry slow down, with mining, manufacturing and utilities negatively influencing partially offset by financial services in 2003/4 to 2007/8 and agriculture , forestry and fishing from from 2007/8 to 2011/12. Simplistically explained this is partially due to significant capital investments in mining and power generation utilities which are yet to deliver returns. The Productivity Commission is currently investigating the causes for Manufacturing’s decline in productivity; the high exchange rate and increased demand for labour (from mining) will likely factor. The positive contributions from Financial services and Agriculture are explained by the credit boom in the lead up to the GFC and the breaking of the drought respectively. The reduction in productivity is a global phenomenon with it occurring in almost all advanced economies over the past ten years, including before the GFC. Hypotheses include a possible under investment in information and communications technology and more recently to a wide spread under utilisation of capital and labour inputs as businesses refrained from making significant cutbacks in resources in the hope of a recovery in global demand. Most recently Australia’s quarterly national accounts indicated a strong increase in labour productivity so far in 2012/13. Importantly however the Productivity Commission warns that the data should be treated with caution as “the increase in labour productivity largely reflects capital deepening, rather than improved productive efficiency”. The next major update on Australia’s MF productivity growth will be available towards the end of 2013. This will provide a better indication of the extent to which a more sustained improvement might be underway. Until then we remain cautious on the nation’s economic outlook given the trend of subdued MF productivity. The impacts of productivity improvements on living standards depend not only on the size of the productivity gains but crucially how those gains are distributed. Benefits can be narrowly or widely distributed. How the benefits of productivity are shared is a very contentious topic, with unions generally advocating for increased wages for labour and right leaning proponents advocating shareholders should benefit. Benefits can also be shared in the form of reduced prices as the company can produce more from the same inputs.